As Barack Obama stepped to the microphone, Joe Biden, with a stage whisper said, “This is a big deal.” He added an expletive for emphasis. And a big deal it was. Our endless health care debate had somehow become law. At least six twentieth-century Presidents had advanced comprehensive health care reform. All had failed. President Lyndon Johnson’s enactment of Medicare and Medicaid in 1965 and President Clinton’s second-term insurance expansion for children were partial steps which, in their targeting (of the elderly, the disabled, kids, a fraction of the poor) served to emphasize the gaps in America’s patchwork “system,” unique among industrial countries. And still, by far, the most costly. The Affordable Care Act, ACA to its friends, “ObamaCare” in the attack commentary, had found its way to the President’s pen in the form of two interdependent bills. In three earlier commentaries, we offered La Cuadra readers a more-or-less contemporaneous analysis on the substance and politics of the legislative journey. Now, nine months (and one electoral shellacking) after the President’s “victory” lap, the law is indeed a big deal. But the political debate it ignited may be inching, even more so, toward a defining moment for the American Republic. The ACA, as we have written, was a big step, but confined to a familiar path. 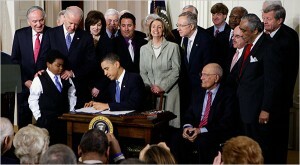 It filled the gaps in insurance, imperfectly, by expanding Medicaid coverage to an estimated sixteen million people and by creating insurance exchanges (organizations which provide online or in-person comparisons of coverage and price information) to offer subsidized private coverage to sixteen million more. It continued to rely on voluntary employer-provided coverage, with modestly increased incentives, for the bulk of the population. After implementation in 2014 and beyond, around twenty million people will still be left without coverage. Of that number, roughly seven million will be undocumented immigrants who, due to opposition demands during the drafting of the bill, are ineligible to participate in the exchanges, even with their own resources. Congress built a major part of the expansion on the Medicaid program, the nation’s state-operated, federal-and-state-financed, “safety net” benefits program for the poor, the disabled and the low-income elderly. Under Congressional Budget Office (CBO) “scoring,” Medicaid was the least costly expansion alternative since it traditionally pays doctors and hospitals less than Medicare and private insurance for comparable services. The ACA requires that Medicaid income eligibility be set uniformly at 133 percent of the poverty level, or just under thirty thousand dollars for an average family. While the Federal Government would pay well over ninety percent of the additional costs, the uniform standard would double, even triple, Medicaid eligibility in more than a dozen states that have historically resisted government obligations for the poor. The divide is cultural, to some extent racial, and now emerges at the core of the Red State opposition to this most recent perceived federal intrusion into states’ rights. Similarly, an inside-the-process quirk gave states the major role in creating insurance exchanges. When Scott Brown’s election in Massachusetts reduced the Democratic Senate count below the sixty-vote supermajority required now for routine business, the ACA could proceed only by using the Senate’s focus on state implementation of insurance exchanges rather than the House version built on a national strategy. While the law still contains the authority for residual national action, the immediate state focus gave impetus to what are now more than twenty state legal challenges, alleging that the ACA’s requirement that individuals ultimately face a tax penalty should they not purchase coverage oversteps the bounds of the Commerce Clause of the Constitution. The argument is that if you don’t buy insurance, you are not participating in commerce and therefore can’t be regulated. The law’s supporters say that this is all about how we pay for health care rather than narrow individual action, clearly interstate commerce, and that insurance purchased voluntarily as sickness occurs defeats the entire scheme of shared risk. A Supreme Court decision will likely clarify the legal dispute. Should the plaintiff states prevail, an amendment to the ACA increasing premiums for those who delay enrollment would be required. The political importance is this: even a Supreme Court ruling against the mandate will not repeal the law. It would require that other, perhaps less effective, methods be implemented to achieve broad participation in the exchanges. These insurance expansions, through Medicaid and subsidized exchange-based purchase, are the “big deal” changes in the law. Additional provisions will guide and support reorganization among doctors and hospitals to assume more responsibility for better coordinating patient care and will provide grants and eventually revised Medicare payment protocols to support the improvements. The watchwords are “value not volume,” replacing fee-for-individual-service payments with new approaches that reward overall quality of care. Anticipated is that private insurance and Medicaid will follow Medicare’s payment-reform lead. To most observers, the cost-control provisions of the law move in a positive direction but fall far short of the targets set later in the year by several proposals aimed at reducing the long-term national debt. Finally, part reform and part political tactic, the ACA has imposed, almost immediately, a series of changes in the practices of the health-insurance industry. Lifetime caps on coverage are lifted, pre-existing conditions for children, later for adults, can no longer be used to deny coverage, young adults nineteen to twenty-six can stay on their parents’ policies, sickness no longer means cancellation of a policy. High-risk arrangements are now available in every state, some under national administration, to insure those previously deemed uninsurable. In addition, seniors were given a bonus payment toward their doughnut-hole gap in Medicare drug coverage, moving toward its eventual elimination. Doctors can even discuss real care choices with dying patients as part of a routine visit. Myriad specific and immediate “improvements” were seen by the White House as concrete steps toward building public support for the law prior to its 2014 implementation.